We grill all year long. It's such a healthy way to go! However one can't help but feel like burger season is coming to an end when the leaves fall. 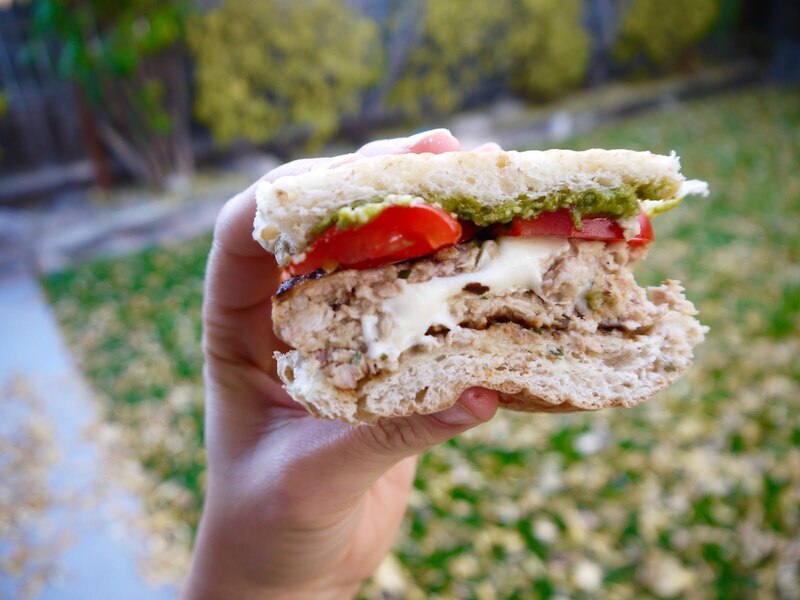 This chicken burger is a perfect conclusion to your season if you're bidding your grill farewell until spring. And if you're keeping it lit all winter like us, well it still makes for a delicious meal. Combine all ingredients except for mozzarella, pesto, buns and tomatoes in a bowl. Use your hands to combine ingredients evenly. On a parchment-paper lined baking sheet form five patties from half of the chicken mixture. On each patty lay 1 oz fresh mozzarella. Form five additional burger patties from the remaining mixture and lay each on top of the mozzarella slices. Seal the edges of the burger with your fingers. Place the baking sheet in the freezer for one hour (vital for burgers holding up on the grill). Heat grill to medium-high heat, then spray with cooking spray. Place semi-frozen burgers on the grill and cook for 8-12 minutes each side, or until internal temperature of the meat reaches 160 degrees. Serve burgers on a whole grain bun, topped with 1 Tbsp pesto and chopped fresh tomatoes. Enjoy!